This year, we girls (Kaka, Ashley & Xue Ying, met them at New Zealand) decided to do backpack the South East Asia, praying hard for Air Asia zero fare offers early 2012. And after much voting from the girls, we choose Cambodia. Luckily, they have the offer but not zero fare, which is cheap back then. And it's much more cheaper now! 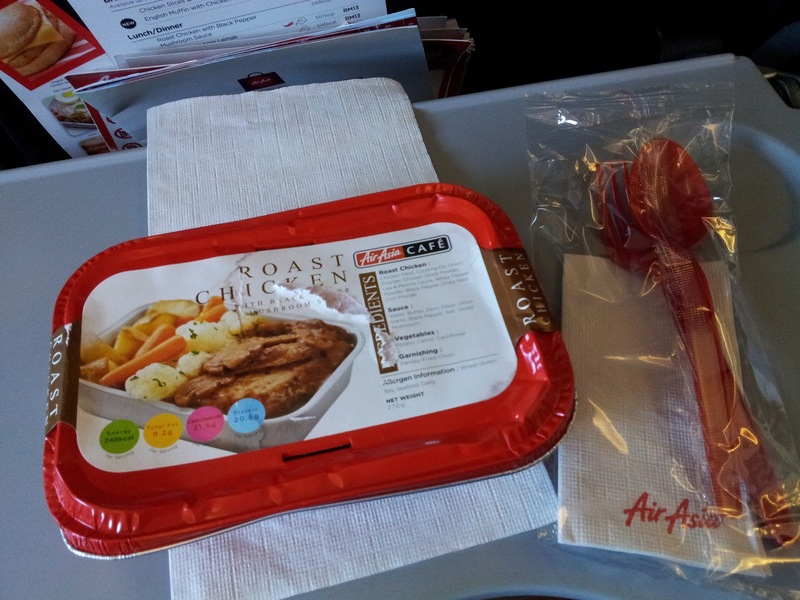 Our return ticket cost reasonably around RM400. Our long awaited backpacking holiday has finally arrived. Since Kaka flew in from Singapore, and I have to fly to Kuala Lumpur from Kuching. Two of us actually wish to spent a night at the airport, and we were worried that we can't get a nap & it might not be safe for us. So, we both spent a night a Tune Hotel because our flight is early next morning. Due to late booking, a budget room cost up to RM198 for a night! Our whole Cambodia trip accommodation actually sum up lesser to that figure! Our early flight, 7 in the morning took off to Phnom Penh, Cambodia. Close to 2 hours flights. 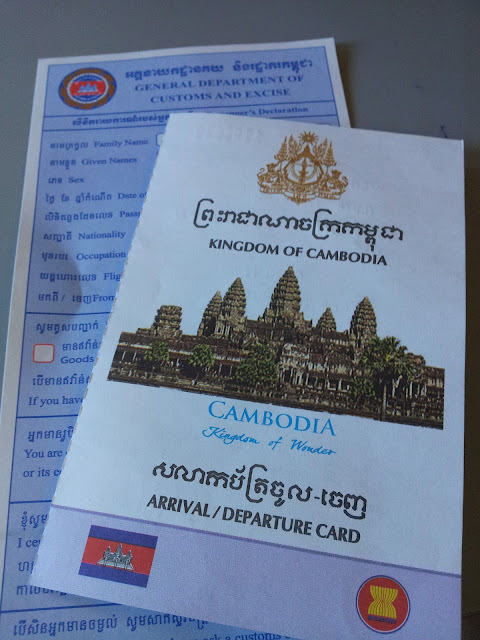 Arrival/departure card of Kingdom of Cambodia to be submitted at the Immigration counter. While the girls busy in catching a Tuk tuk to the Hotel, I bought a Local sims card which cost me USD5 for my 5 days trip. Just call plan and free 300mb of internet data plan. Anyone who visit Cambodia, I think its much more advisable to choose the internet data plan because the coverage is wide there, minus the road trip to Siem Reap. Our 1st group pic on Tuk Tuk. They charged us USD10 from airport to the Hotel in town area. "BEEP BEEP" aka honking is very common here. Just a friendly reminder for those who are unware of the vehicles behind them or for those who are going to cross junctions. I think I heard more than 50 honkings before reaching the Hotel. We booked VIP Room, a 2 beds room for 4 of us at USD30. CHEAP!!! Central Market, Choeung Ek Killing Fields, Tuol Sleng Genocide S21 Museum, Independent Monument, Royal Palace & Riverfront. Our 1st stop will be the Central Market, of course! After a round of walk at the food court stalls, we chose this chicken noodle because it looks so "normal". Pardon me, because we don't dare to taste other kind of Khmer food. No offence here. The Chicken noodle. I cant recall the price, but its cheap! Posing before eating the noodle! LOL! 2nd dish - Fried Khmer Chai Kueh. Taste good! The other two girls (Xue Ying & Ashley) went to buy this dessert and we shared. After finishing this bowl, the girls actually told us that the seller just rinse the bowl with water! Of course, Kaka & I were both shocked enough! we keep telling ourselves, don't bother so much about hygiene there. We even had our tap water boil to fill up our tumblers. I think due to the poor water filter system, somehow the water is a bit yellowish & taste like metal. Anyway, our stomach is kind enough to accept it and no one fall sick!